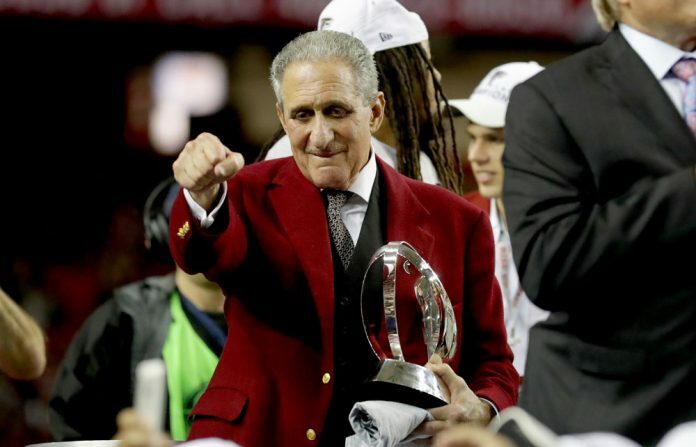 Arthur Blank holds the George Halas Trophy after the Falcons' victory over the Packers on Sunday. 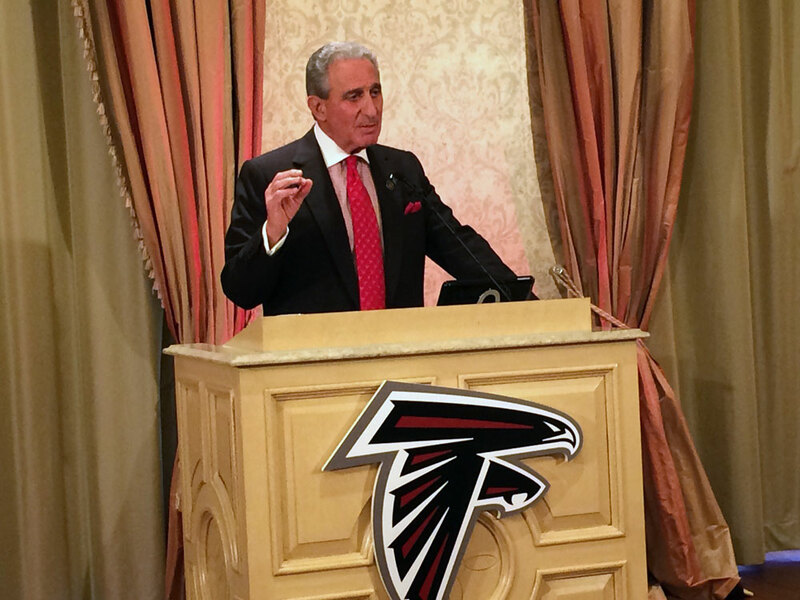 Blank discussed not just the upcoming Super Bowl appearance (the second in franchise history and the first with him as owner) but also the upcoming inaugural season of his MLS franchise Atlanta United FC, President Trump, and how he’ll know his efforts to rejuvenate the neighborhoods in the shadow of Mercedes-Benz Stadium are bearing fruit. How is Atlanta United looking? I was down there [in Florida] on Tuesday for their first day of practice. We’re going to win all our matches. Of course. I’ll add that the team is going to be featured on our March cover. That’s wonderful. There’s a lot of good looking young men. We had them do a lot of acrobatics for the camera. Well they can do it all. Back to Sunday’s NFC championship victory over Green Bay—I’ve been to a lot of games at the Georgia Dome over the years. And it was louder than I’ve ever heard it. People stayed to the very end. What does reaching the Super Bowl mean for Atlanta? It means a lot. People love Atlanta for a lot of reasons. But they’re always anxious to have a sense of pride in where they’re living. The success that our team has had this year in bringing the community together—that’s one of the things that sports, particularly team sports, does. People love to come to one place together and celebrate as a collective family. To be able to be part of that is a great joy for me. But it’s even more exceptional for Atlanta, where we’ve had a major sports championship drought. It’s been more than 20 years since the Braves last won the World Series. And we’ve never won a Super Bowl. Our goal has been to create a franchise that is a sustainably winning one. We had five consecutive winning seasons under Coach Mike Smith [whom Blank fired after the 2014 season]. That was the first time we’d had back-to-back wining seasons, much less five. Now, with the combination of coach Dan Quinn, other coaches, other players, [general manager] Thomas [Dimitroff], his staff, [assistant general manager] Scott [Pioli], we’ve taken this to the next level. The beauty of a lot of what I see, other than our kicker [41-year-old Matt Bryant], who’s probably older than I am, we have a very young roster. And I was thrilled last night when I was reading Pro Football Talk, where Matt Ryan said he hopes to play as long as Tom Brady. Matt’s been a great part of our success, and I really couldn’t ask for a better person as the face of the franchise, on the field and off. When you bought the team back in 2001, you met with Patriots owner Robert Kraft, who advised you to apply the lessons you’d learned at Home Depot to owning the team. Has there been any communication this week? Robert emailed me during Sunday’s game. He was rooting for us. It’s been a dream of ours to compete against each other personally. I’ve often had to remind him that we’re not actually going to be playing each other on the field . . . it’s our teams who will! He’s probably my closest friend as an owner. But I was anxious to see this happen. We’ve never played in a Super Bowl under my ownership. We’re competing against an outstanding team that has an unbelievable record. It’s almost like playing in the New England Patriots Super Bowl Invitational, they’ve been there so often. To what degree have these last few weeks been a distraction from what’s coming out of Washington and a new administration. You’ve been a staunch Democrat for a good chunk of your life. It’s not really a distraction. I’ve always voted really more based on the person than the party. I do tend to vote more Democrat than Republican. But I support Republicans. Our governor [Nathan Deal] has done an incredible job, and I’ve been a big supporter of his. And U.S. Senator Johnny Isakson, who’s a great friend. But to answer your question, what’s made our country great is the fact that we’ve always been a country of great diversity. My grandparents, my wife’s family, have come from a variety of countries. Diversity, inclusion, building up opportunities and visions for everybody—that’s what’s made us a great country. And [having] a strong middle class has made us a great country. There’s been an erosion in the middle class in the last 20 years or so, and that worries me, the gap between the haves and have nots. I don’t want to see anything that moves us further in that direction. I worry about that. And I worry about creating any walls—forget about just physical walls, but any versions of walls where we are not the accepting country that we are and where people can come to live out their dreams. When the president says “Let’s make America great again,” that’s what made America great for many, many years. People have come here and achieved at levels they’ve never dreamt possible. That’s certainly true of myself and my partner Bernie Marcus [co-founder, with Blank, of the Home Depot]. Could it have happened in another country? Maybe. Maybe not. This isn’t a a matter of writing more checks, of wealth redistribution. It’s a matter of creating more opportunities, more education and training. People will take advantage of that. On that subject, to what degree are there parallels or differences between what you’re doing on the Westside, in the neighborhoods of English Avenue and Vine City, and what Tom Cousins did at East Lake? In many ways it’s comparable. Tom did an incredible job in that community, with the golf course being the center of it. We have an opportunity, and it’s one of the reasons we wanted the stadium to be downtown. Every great city has a great downtown, across the world. Atlanta’s no different. In the last 20 years there’s been so many great new venues and new attractions downtown. People have moved downtown. There’s great diversity. We wanted to be a part of that, positioning our stadium where we have great public transportation, which invites inclusion and diversity. Being positioned against the Westside, which has not enjoyed the kind of growth that other parts of Atlanta have, is a unique opportunity for the stadium. Not by itself, but as a catalyst to bring together a like-minded group of for profits, nonprofits, and individuals that collectively help that area become the area it deserves to be in terms of opportunity and the rich heritage it has. Two years from now, when the Super Bowl is in Atlanta, what do you want to see in those neighborhoods that you don’t see today? What we’d like to see is a neighborhood where public education, safety, health, job opportunities—all of those things are moving in the right direction. A lot of those now are moving in that direction, after 20 years or longer of moving in the opposite direction. [Those] communities are probably ten percent the size they used to be. [Many would] say they had been communities that had failed or were failing. But Atlanta is a great city, and there are great opportunities here. It’s a question of recognizing that it’s not just one answer. It’s listening to the citizens there, understanding what their needs and opportunities are, and us responding to that. It’s not a question of coming in with a super master plan and saying, “This is what you need.” It’s finding out what the patient is telling us—what they feel good about and what they don’t feel good about—and what’s the best way to support them. The benchmark for success the feedback you get from . . .
From the people living there. We spent three years, before even starting the stadium, attending probably 200-300 community meetings. We’re still doing that today, trying to listen and understand. Frank Fernandez [who’s heading up the Blank Foundation’s efforts on the Westside], he’s walked every street there I don’t know how many times. And I would guess he’s probably met well over half the people living in those zip codes, without exaggeration, trying to understand what the highest needs are, what the barriers are, and what we can do in a positive, productive way, without just writing checks to people.